This is a new replacement center console mounted fuel / gas gauge for use on 1967 Camaro models with console mounted gauge package. 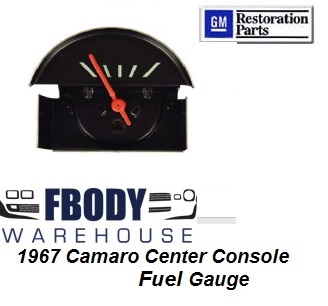 This is a new replacement center console mounted fuel gauge for use on 1967 Camaro models with console mounted gauge package. Correct black face with original.heavy screened text and indicator lines reproduces the original factory installed gauge appearance exactly. Mounts as original. Includes required external ceramic resistor.